For the next week or so it looks like we will be getting some light rains or scattered showers. It doesn’t look like enough rain to make the rivers rise much. In fact, the Klamath Trinity River Basin is on the down side. Yes, the Klamath Trinity rivers are dropping, The Trinity not as much as the Klamath. The good news is that most all of the reservoirs are 80% or better of capacity except for Lake Oroville (11%) and Millerton Lake (55%). With this information plus the Snow Pack (yet to be announced) it appears that the state is over the drought for sure and water quotas for all should be sufficient to allow farmers and rivers to have the very much needed waters. The CDFW proposed “New” regulation changes for the Eastern Sierras Trout fishing on paper looks good but if you take into account the weather conditions and lack of personnel available for the proposed “Opening”, the safety of the general fishing public could be in dyer trouble what with deep snow and bad cell phone reception. I hope that CDFW will take another look at the proposals and consider the public’s safety before they make anything permanent. I am sorry I have not received the results from the PFMC meeting yet but one should be able to get the results by going to their web site. 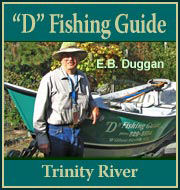 Fishing: Fishing this last week has been on the slow side for the Trinity and I have not received my usual information from the Klamath side but from the water flows it appears the both rivers were too high for much good fishing. If the rivers continue to drop, I am sure fishing will pick up during the next week. I hope everyone has great Easter and those who do go fishing I wish them “Good Fish’en”. Mid-Klamath: Iron Gate Dam is releasing 4,560cfs. at this time. I don’t think there would be much fishing above I-5 with this kind of releases from Iron Gate. The water flows in the Happy Camp area is 10,436cfs which is very high at this time but dropping fast. Orleans and the Weitchpec areas are way to high to even consider fishing at tis time but should be fair to good flows in about a week. Lake Conditions: Whiskeytown is 98% of capacity (an increase of 2%) with inflows 1,270cfs and releasing 670cfs on to Keswick and the Sacramento River. Shasta is 90% of capacity (an increase of 2%) with inflows of 24,409cfs and releasing 38,964cfs into Keswick. Keswick is 8489% (an increase of 2%) with an inflow of 40,394cfs and releasing 39,749cfs into the Sacramento river. Oroville Lake is 11% of capacity (a decrease of N/A% plus N/Aft) with inflows of 19,717cfs with releases of 10,370cfs into the Feather River. Folsom Lake is 82% of capacity (an increase of 2% plus 2ft) with inflows of 9,109cfs with releases of 9,935cfs into the American river. Trinity Lake: the lake is 20ft below the overflow (a decrease of 9ft) and 87% of capacity (an increase of 5%) inflows are 5,398cfs and releasing 238cfs into Lewiston Lake with 5,160cfs being diverted to Whiskeytown Lake and on to Keswick Power Plant, which is releasing 39,749cfs into the Sacramento River. Trinity River flows and conditions: Lewiston Dam releases are 307cfs and water temperatures of 50.39degrees and air at N/A as of 9:00am today Sunday Apr. 14, 2019. Limekiln Gulch is 5.18ft at 623cfs and water temps of 49.3. Douglas City is 7.33cft and flows of 1,104cfs. with air temps of 51 and water at 54 degrees. Junction City is 3.77ft at 1,420cfs. Helena is 12.15ft at 2,153cfs with water temps of 50 degrees. Cedar Flat (Burnt Ranch) is 7.98ft at 3,786cfs. South Fork of the Trinity is 7.52ft at 3,618cfs. Willow Creek is estimated at 7,414cfs and air is 55 degrees and water at 50 degrees. Hoopa is 19.13ft at 12,292cfs with water temp of 50 degrees. Water flows at the mouth of the Trinity River at the Klamath are estimated to be 33,979cfs. Klamath: Iron Gate is releasing 4,560cfs. Seiad Valley is 8.14ft at 9,345cfs. Happy Camp is estimated at 10,436cfs, the Salmon River is 6.34ft at 5,633cfs, Somes Bar is estimated to be 16,054cfs. Orleans is 11.79ft at 21,687cfs, the Klamath River at Terwer Creek is 18.41ft at 44,316cfs and water temps of 50.8 degrees. Flows for the Smith River at Jedia Smith is 9.91ft and flows of 5,995cfs. and flows at Dr. Fine Bridge are 16.16ft at N/A cfs. Temperatures in the Valley last week were 77 hi with a low of 46. Rain for the week was 2.00in with total rain for the water year to date of 61.45 inches, with snow of 4.5in. in the valley to date. The north coast weather is predicted to have light rain and scattered showers with cloudy days in the mix. The Trinity Valley is predicted to be the same. Come on sunshine!